This fall, The Fletcher Forum sat down with Saskia Keeley, a Swiss-born and Manhattan-based photographer to learn more about her work with NGOs worldwide. We are pleased to feature a selection of images from her latest projects in the Democratic Republic of the Congo and The West Bank along with the interview. The Fletcher Forum: What first drew you to international photography? Saskia Keeley: From an early age I reveled in documenting my trips, spending countless hours cataloging my visual memories in albums that were then saved and stacked on shelves over the years. About a decade ago a family collaboration with a NGO in Cambodia led to our helping Khmer youth get sufficient education to advance themselves and their communities. My photography was one of the tools used to bring awareness to the efforts and successful actions taken by that NGO. A few years later, when I was ready to start a new chapter in my life, I realized that international photography and documentation was my calling. I experienced an especially deep sense of purpose by combining my photography, my love of traveling, and cultural interconnection when promoting the missions and visions of humanitarian organizations I admired. FF: You have suggested that your “greatest passion is documenting people, events and cultures in ways that foster lasting connection, surprising empathy and occasional awe” – how does photography accomplish this in ways that other efforts cannot? SK: I believe in the power of the visual. Two examples illustrate: Aylan Kurdi, the little Syrian boy whose lifeless body washed ashore in Bodrum, Turkey and was carried off by a paramilitary police officer. That photo hit a nerve and became a symbol of the gross indifference of developed nations to a horrible plight on their own shores. Then there was the iconic image of the 9-year old Vietnamese girl running for her life, covered in napalm. Though taken 44 years ago, that photo is just as searing and instructive today. Poignant photos can cross cultures and impact consciences the globe over. In my work I seek opportunities and moments for connection that go beyond words and happen within a split second. I try to capture the realities I perceive with objectivity while maintaining the trust and dignity of those who come under my camera’s gaze. This is a surprisingly delicate balance. What I have experienced over and over is the achievement of a deep emotional connection and a sense of belonging, even though I am "an outsider." Some element of common humanity has allowed lasting bonds to develop every time. FF: The Forum recently spoke with Ellen Agler of the END Fund. Can you tell us about your work with them in the Democratic Republic of the Congo (DRC)? SK: I was hired by the END Fund to document a specific project taking place in Idjwi, an island off the coast of Rwanda but a part of the DRC. The END Fund works collaboratively with Amani Global Works (AGW), an Idjwi and NY-based organization, to tackle fully treatable but otherwise neglected tropical diseases on this small island. In December 2015 a mapping program was launched to identify parasites that cause rampant intestinal worm infections in the vast majority of the population of 250,000 people. My assignment was clear. The END Fund wanted photos of the community health workers’ mapping program and the protocol and procedures it applied. I followed the lab technicians throughout their training program as well as in their visits to the local schools where they were assigned to collect samples. But my work also allowed me to document the tremendously inspiring and empowering work done by AGW and the END Fund. Amani Global Works paves the way for better health and education throughout Idjwi – providing daily a nutritional porridge to malnourished children, running a primary school that provides education for girls, and sponsoring a deworming program lifting the heavy long-term burden of living with worms. FF: You're here at Tufts to talk about your work with Roots, an initiative led by a joint Palestinian and Israeli committee based in the West Bank. 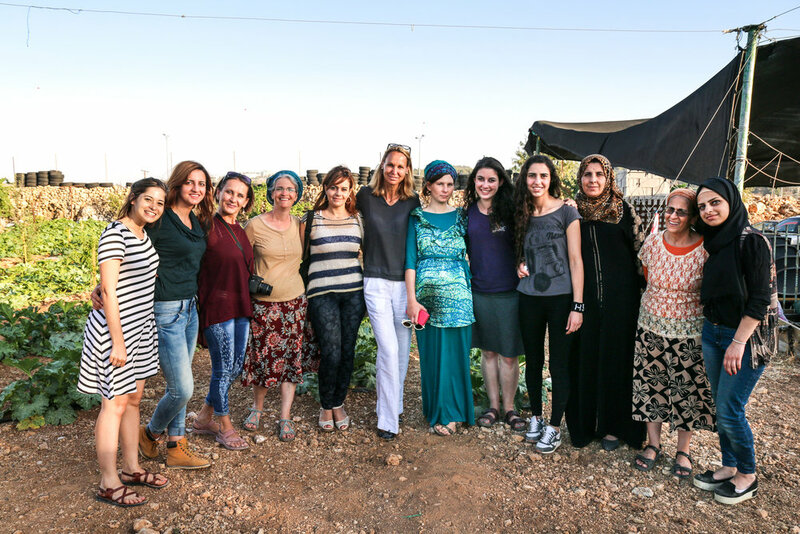 I understand you recently conducted photo workshops for mixed groups of Israeli and Palestinian women. SK: I met Hanan Schlesinger, Roots’ leader, in India while attending a seminar. I was deeply taken by his description of how his organization breaks down deeply embedded stereotypes and combats fear, anger, and hate by bringing the two sides together in a variety of forums. Hanan mentioned a photography workshop for young Palestinian and Israeli boys taught by a man. Culture and tradition make it impracticable for women to participate, since it is led by a male figure. I offered to conduct a similar photo workshop for women and girls. It had never been done before. One critical challenge was retaining good-quality photo equipment. I sponsored a fundraiser and purchased 20 cameras that made their way to Roots in the West Bank. My enthusiasm and commitment needed to be matched by Roots. I asked that they provide well-organized programs, with motivated attendees from both the Israeli and Palestinian communities. FF: What challenges did you face there, and what successes did you ultimately enjoy? SK: There were many sensitivities to take into account. Because Roots works within their own communities at the heart of the conflict there are unique dangers. It is generally a safe assumption that most of the participants coming to these projects are there out of a desire “to meet the other.” For the Palestinians, however, it is extremely hard to deal with the consequences: they could be accused of collaboration with "the enemy" and risk being ostracized by their friends and neighbors. Some Palestinian factions have engaged in what is known as the Anti-Normalization movement, which demands that all contact between Palestinians and Israelis be severed. So that neither group would feel overwhelmed or underrepresented Roots planned to have the exact same number of participants from both sides. Both workshops had 14 women: 7 Israelis, 7 Palestinians. A crucial priority was to keep the trust of those who participate. Some of the women who came had their "first meeting" with Israelis in the workshops, and vice versa. 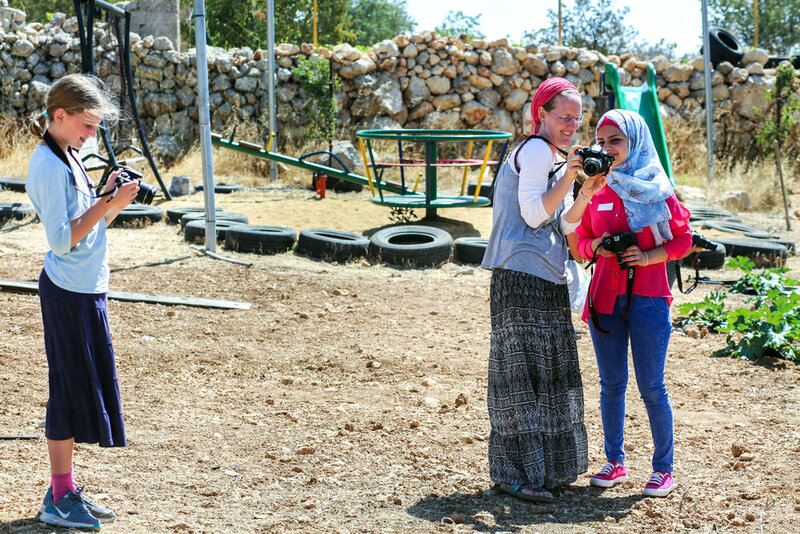 The purpose of this first initiative—offering photo workshops to Palestinian and Israeli women—was about building trust and meeting on a personal level. For Roots, this was another small step in what is a very long but real process of promoting mutual understanding. Given the workshops could only take place in a safe environment for both peoples, 99% of West Bank locations were eliminated. We confined ourselves to the Roots compound for three out of four sessions. With great perseverance I managed to convince Ali Abu Awwad, the Palestinian leader, to allow us one session outside of the compound, in a secluded and discrete place in the countryside. The collaboration we achieved was beyond my expectations. There was never a grandiose illusion that these photography workshops could end the conflict. But every journey begins with the proverbial first step - and then other steps towards humanizing and understanding become possible. Small and big moments happened within the gatherings over the two-week period. I witnessed a distinct change in the women’s way of looking at one another and interacting. I believe those changes will have lasting effect. FF: Were you surprised by any of the photographs the women took, or their interactions with each other via this shared photographic language? SK: Yes! In fact, I was astounded by many of the photos that the women and girls took! I am mentioning girls because there was a 12-year old Israeli girl who attended the workshop with her mother who was really gifted. I had moments of concern and uncertainty while assembling the program, but it was pure joy to see that the women were keen and enthusiastic learners. They took photos that were carefully planned out in their composition and lighting, including beautiful portraits. Because most sessions took place in a very small plot of land, they had to be quite creative. They did amazingly! Most importantly, the camera became a bridge, breaking down barriers and fostering contact. The fact that they had to take portraits of each required human connection. They truly bonded over the photos they took of one another, gazing at the camera screen together, approving and laughing. Participants were also allowed to keep the cameras for the duration of our time working together. That allowed the women to bring them home and illustrate their own lives, environment, and family. I couldn’t wait to see what they had captured whenever we reconvened. The photos that came out of their home assignments were striking and often touchingly personal in their portrayal of loved ones in an intimate setting. FF: Do you think this model can be exported to other places, particularly other areas of protracted conflict? SK: Absolutely! Developing artistic resources is a great tool not only for healing but for empowering. We know that art, music, and dance are all great forms of therapy. Photography allows an individual to be really seen and to have a potent form of expression. It fosters opportunities to reflect on and voice their own stories, and those of their surrounding community. That expression becomes dialogue once shared. Roots, for example, wants to expand that model and welcome more opportunity for that kind of assertion and expression. I will be returning to the West Bank this coming year offering more joint photo workshops. There will also be an opportunity to work with Palestinian women in places of frequent encroachment and struggle over land. Enabling photographic self-expression in regions of harsh reality and protracted conflict is not new. An all-girl media workshop took place in the Za’atari Syrian Camp in Jordan. It was funded by a few well-known NGOs. Renowned artist Reza traveled to a camp of Syrian refugees in Kurdistan in 2013 and established a photo workshop for the children in that camp. I would love to participate in this kind of empowerment in other places over time. Saskia Bory Keeley is a Swiss photographer based in Manhattan. Saskia principally partners with humanitarian organizations, taking into account their sensitive and noble endeavors. She strives to paint a picture of what is possible, and to promote changes that happen when understanding and empathy converge. Saskia has collaborated with a number of institutional organizations to record signature, public events and candid moments for promotional use. Her work has been featured in several magazines, corporate annual reports, and on numerous websites. Sep 24 Could Rights-Based Development Encourage Rural Moroccan Women's Capacity Building?